In the past few articles (Introduction to HTML5 for ASP.NET Developers, Using HTML5 input types in ASP.NET and Working with HTML5 Canvas) I discussed HTML5 features that every ASP.NET developer should be aware of. In this article I will focus on HTML Forms and discuss some enhancements that make your life easy. Merely using various <input> types is just one part of the story. 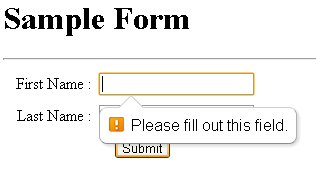 You should also know HTML5 features that are applicable to the form as a whole. This article illustrates some such features. All the examples use Chrome as a browser but many can be tested in Safari, Opera and others. placeholder="Must be min. 3 characters. Only alpha allowed." Notice how Placeholder attribute specifies a string that appears in the textbox. As you can see they do almost the same trivial job of displaying a message with a minor difference. The Index() method sets "Welcome" message in the ViewBag whereas Index2() action method sets "Hello" message in the ViewBag. 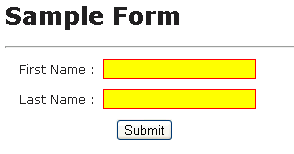 If you don't set formaction attribute on the submit button, the form is submitted to the Index() action method. However, if you set the formaction attribute, Index2() action method is called. Notice how the autocomplete attribute is set to off to turn the autocomplete feature off. If you want to enable autocomplete for a specific field you can set autocomplete attribute to on. 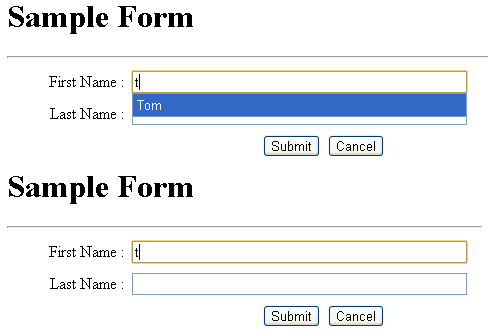 The following figures show firstName textbox with and without autocomplete.